The GAZ design bureau developed the GAZ-67 utility vehicle based on the four-wheel drive GAZ-64 car. While widely used throughout the Soviet Army in World War II, the experience with this vehicle showed it to be inferior to the US Willys-made MB Jeep. GAZ upgraded the vehicle into the GAZ-67B to put it on par with its American counterpart, and this version would see production into 1953. The 45mm anti-tank gun was standard issue in the early days of WWII (the Great Patriotic War), with a 'gun limber' included to safely carry the ammunition outside of the vehicle. This kit is provided on seven parts trees molded in an a variety of colors. The three trees molded in light gray are for the 45mm anti-tank gun, the single tree in tan styrene is for the gun limber, while the remaining three brown trees are for the GAZ-67 'Jeep'. The anti-tank gun kit is nicely done though the tip of the barrel would look better hollowed out. The gun, aiming mechanism, gun shield and transport are nicely detailed. Even a box of 45mm shells in a wooden container is included. The limber kit is a simple affair that nicely replicates the trailer used to haul explosives behind these vehicles. The GAZ-67 itself is also nicely detailed. About the only thing not done in this particular kit is to provide a complete engine block. The bottom of the engine is molded as part of the chassis and the hood is not intended to be positionable, so there is no way to display this GAZ with the hood up unless you take to some scratch-building. Otherwise, the GAZ kit is as well-detailed as the gun and limber kits. This is an interesting addition to your scale battlefield. 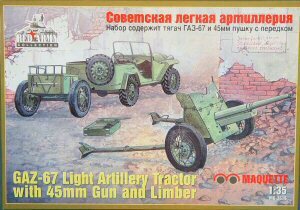 If you are a modeler of the Great Patriotic War, you need one of these GAZ-67 kits as these were as common as the Jeep on the 'Western Front'. You can find this kit at Squadron Mail Order.